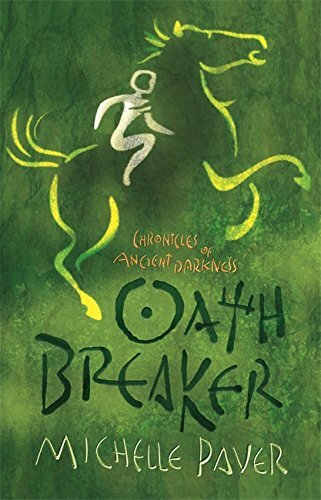 Oath Breaker is the fifth in Michelle Paver’s sequence ‘Chronicles of Ancient Darkness’. Readers unfamiliar with the earlier books are at a disadvantage in the early stages, and will only gather as they go along why Torak, the 15-year-old hero, is set apart from the clans of his forest homeland. The setting for the series is northern Europe six thousand years ago, after the Ice Age but before the spread of agriculture, when the land was covered by forest and occupied by small human tribes, some partially settled and some nomadic. The forest world is overseen by a World Spirit, but threatened by evil Mages called Soul-Eaters. The young Torak was fated at birth to cleanse the forest of evils. His strength is that he is a ‘spirit walker’, able to merge with the inner beings of non-human creatures, crucially a wolf who becomes his companion; his weakness is that clan membership is denied him. In Oath Breaker Torak vows to avenge the death of his friend Bale, for which he was partly responsible, by killing Bale’s murderer. The book is the story of his pursuit of the murderous Soul-Eater, and the climax comes when he both breaks and fulfils his oath. The book is a fantasy, with elements of the supernatural, as well as an evocation of early modern humankind, where later patterns of society are already visible: shifting alliances and local conflicts turning into regional quarrels, aggressive beliefs and bigotries, and the methods of would-be dictators. This remote world is vividly imagined, but the story is episodic and essentially thin, padded out by many incidental crises. It will appeal to readers of the earlier books, but there are clear signs that the overall story line is being overstretched. A sixth and final book is still to be published.